How I miss Tuna. For me, it wasn’t just something to put on a bread, it was the ultimate snack-in-a-can (second only to baked beans in tomato sauce). Maybe it was because I was growing up in Netanya, a city full of Lybian immigrants that take spicy tuna sandwiches as seriously as their former leader took his dresses. So seriously, that even during my short days playing football for the city’s youth team, right at the exit from the stadium a mithological figure by the name of Vito Chocha, was selling us Tuna sandwiches to keep us strong. 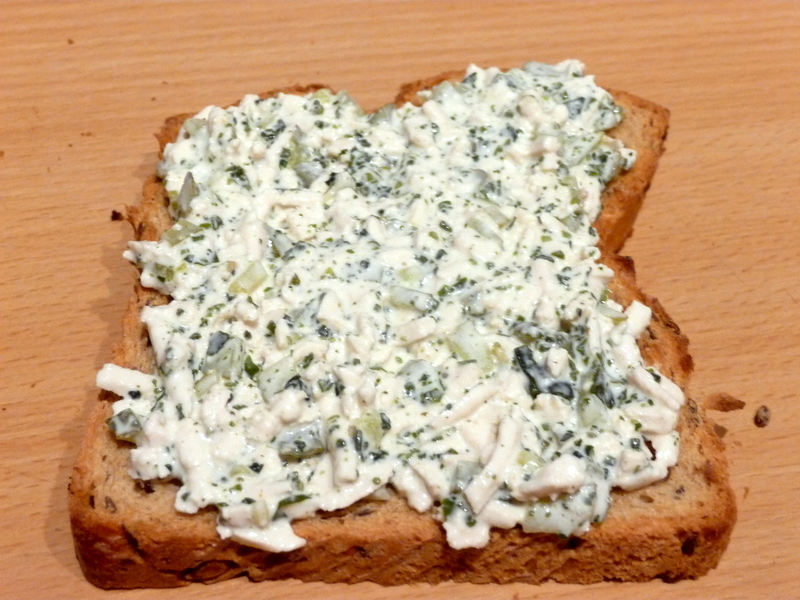 Anyway, a sandwich with tuna salad, with or without mayonnaise or different herbs, always with lemon and pickles, was a cornerstone of the cuisine I was growing on. And it was one of the first things I was craving to replace, until now, without success. I have come up with two variations, just like tuna itself. You have the oil people, and the water people. I was a water person, and a dry result, similar to tuna in water, is something I couldn’t reach yet. But a replacement for the oily, fishy one – definitely. The making is easy-peasy. Just roughly grate the tofu, mix with everything else and let it stand for an hour or two in the fridge before storming it with forks and toasts. Again, the assembly is really easy. Just chop everything and let it stand together for the flavors to settle down. But what can we do with all this tuna now? 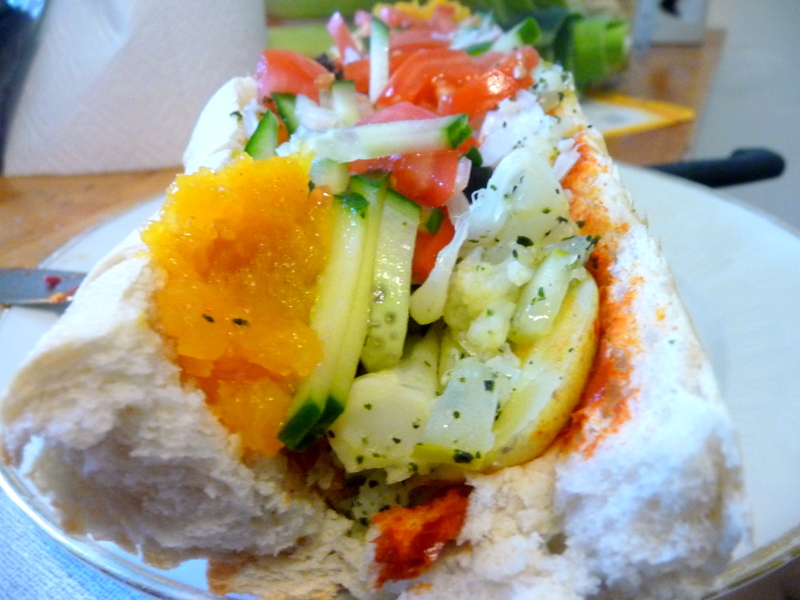 In Netanya, the most common street food is called Tunisian Sandwich. A massive lunch served in a fresh baguette or in a fried bun. I’d rather stick to the baked stuff, it’s heave enough as it is (and yet, it is something you just can’t resist). On one side of the baguette you spread Harissa, on the other side – Chirshi, which is mashed cooked pumpkin with lemon, garlic and cumin. The middle is then filled with a large amount of tuna from the second kind, no mayonnaise here, cooked potatoes (originally also boiled eggs, you can replace them here with kala namak salt), chopped cucumber, tomato, onion, black olives and capers. Posted in Sandwiches, SubstitutesTagged Cauliflower, Seaweed, Tofu, Tuna, Vegan Tuna, טונה טבעונית, סנדוויץ' טוניסאי טבעוניBookmark the permalink.